This guide explains how to set up mod_chroot with Apache2 on a Debian Lenny system. With mod_chroot, you can run Apache2 in a secure chroot environment and make your server less vulnerable to break-in attempts that try to exploit vulnerabilities in Apache2 or your installed web applications. 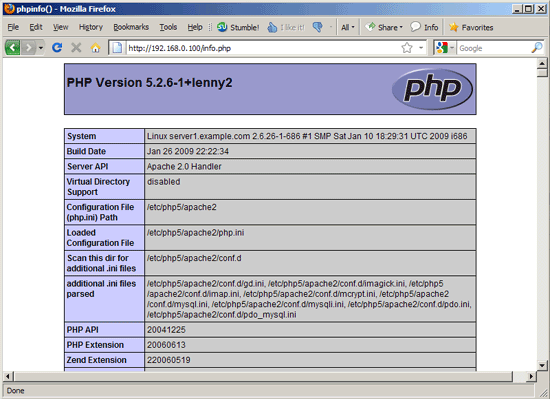 I'm assuming that you have a running Debian Lenny system with a working Apache2, e.g. as shown in this tutorial: The Perfect Server - Debian Lenny (Debian 5.0) [ISPConfig 2]. In addition to that I assume that you have one or more web sites set up within the /var/www directory (e.g. if you use ISPConfig). I'm not running ISPConfig, but I do have a fairly standard setup of apache2 (2.2.9) on Debian Lenny. These instructions break it in a maddening manner. My ServerRoot is /etc/apache2; vhost configs are set up in the usual way under /etc/apache2/sites-available (and ./sites-enabled); the site files themselves are under /srv/www/(sitename)/public_html, etc. AuthName "Access restricted to domain.com developers"
Note the goofy mix of chroot'd and not-chroot'd directories. The chroot'd DocumentRoot will trigger warnings when apache2 is started; if you ignore those, then everything appears to work OK. However, if the ErrorLog directive uses a chroot'd path, then those warnings somehow trigger a fatal error that causes apache2 to not start at all. (This makes debugging this a real adventure.) But, once it's running, the non-chroot'd paths for both ErrorLog and CustomLog seem to work just fine. I've verified that the DocumentRoot, ErrorLog, CustomLog, and AuthUserFile directives all work with this setup. I'm not sure about the rest. It's possible there's something seriously wrong with my setup, but everything's been working great for months (until now), so if there is, I don't know what it is. As a consequence I am getting error 403 when I try to connect to it.